Table Top Display Show Case. Bronze anodized aluminum frame and tempered glass construction. Key lock with three shelves. Measures 14'' wide by 12'' deep and 27'' tall. 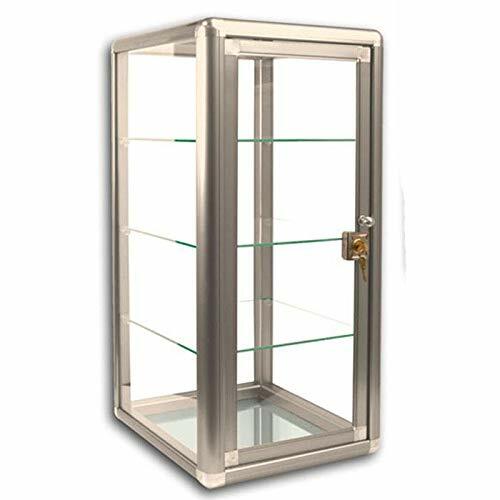 This beautiful vertical glass jewelry display case with shelves is a great option for setting on top of a showcase, or somewhere near the point of sale to catch the eye of your customers. It has three shelves so that you'll be able to place a wide variety of jewelry, watches, figurines, or whatever you choose! The keyed lock will help to keep your items safe (keys included). If you have any questions about this product by RJ Displays, contact us by completing and submitting the form below. If you are looking for a specif part number, please include it with your message.